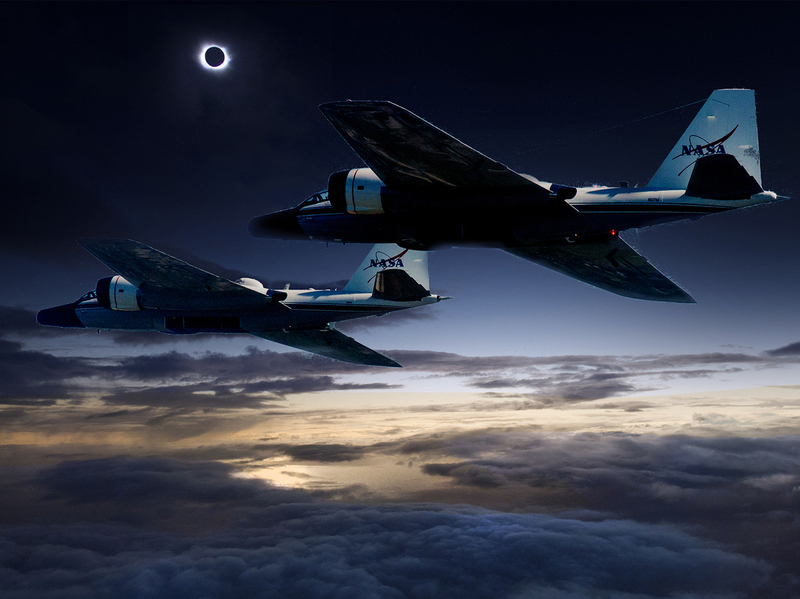 NASA Jets Will Extend Solar Eclipse By Chasing Moon's Shadow : The Two-Way Cold War-era tactical bombers specially equipped with stabilized telescopes will fly over the central United States on Aug. 21, taking detailed observations of the Sun's atmosphere. A NASA illustration showing twin WB-57F research planes tracking the eclipse over North America. If you're lucky enough to be in the path of totality for the Aug. 21 solar eclipse over North America, you will get at best about 2 ½ minutes to view the moon nearly covering the disc of the Sun. But a team of NASA-funded scientists have figured out a way to get a much longer look. For them, totality will last three times as long as for the rest of us — more than 7 minutes. They plan to use the extra time to produce detailed observations of the Sun's corona and temperatures on Mercury. How will they do it? 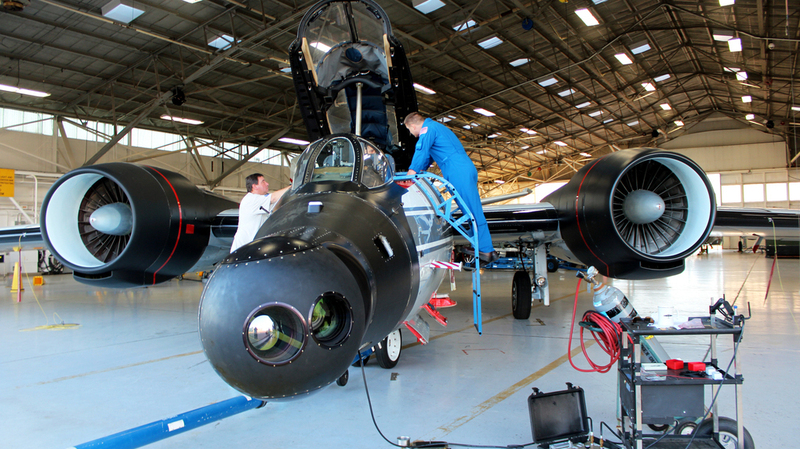 A team from the Southwest Research Institute in Boulder, Co., led by Amir Caspi will be flying in a pair of converted Cold War-era jet bombers equipped with stabilized telescopes in their nose cones. 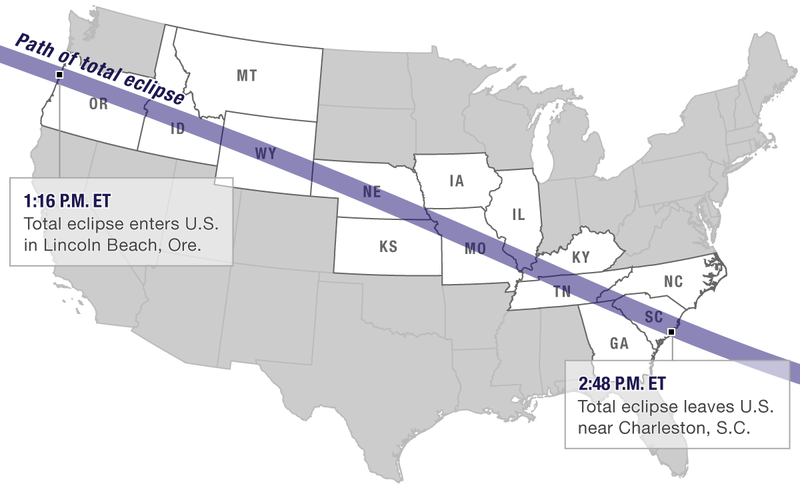 They will essentially chase the moon's shadow as the path of totality moves across the central United States. "These could well turn out to be the best ever observations of high frequency phenomena in the corona," says Dan Seaton, co-investigator of the project and researcher at the University of Colorado in Boulder, Colorado, according to NASA. "Extending the observing time and going to very high altitude might allow us to see a few events or track waves that would be essentially invisible in just two minutes of observations from the ground." The twin WB-57F research jets, converted "Canberra" bombers built in the 1950s, will take off from an airfield near Johnson Space Center in Houston, Texas, climb to 50,000 feet and maneuver into the path of totality somewhere over Missouri, following it over the state and across Illinois and Tennessee. Not only do they get a longer observing time, but looking at the eclipse from the stratosphere will have the added benefit of darker skies and less atmospheric disturbance. One of the WB-57F jets that will observe the total eclipse for about three and a half minutes each as they fly over Missouri, Illinois, and Tennessee. The scientists hope to create the first-ever thermal image of Mercury and answer a puzzling questions about the Sun's atmosphere: why its different layers are so unevenly heated, ranging from millions of degrees to only a few thousand. One theory is that the high temperatures could be caused by the accumulated effect of something called nanoflares, which are too small and too numerous to be detected by themselves under normal observing conditions. With the sensitive telescopes and the dampening effect of the eclipse, scientists just might be able to see evidence of nanoflares. "We see the evidence of nanoflare heating, but we don't know where they occur," Caspi says. "If they occur higher up in the corona, we might expect to see waves moving downwards, as the little explosions occur and collectively reconfigure the magnetic fields."